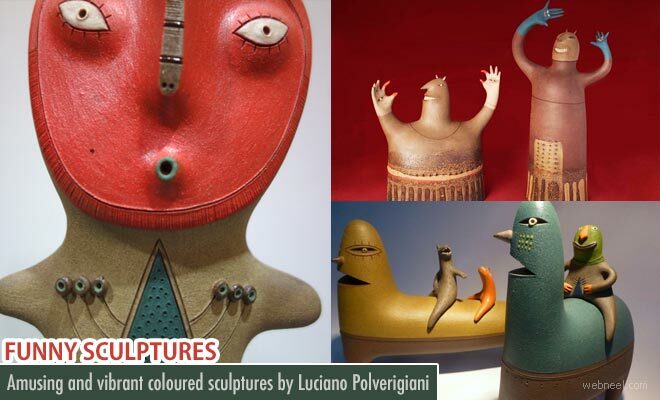 Funny Scuptures : Luciano polverigiani is based in Argentina who has an experience of 20 years in ceramic art and infinite techniques. As a fact ceramic art clubs in itself infinite possibilities for which the knowledge of materials is very much important. It needs lot of tests and trials to identify the right one. Luciano works with enamels and glazes of colour and the materials that the antique people of America are working with. He cooks the art-pieces at 1180 degree centigrade which he feels is ideal temperature for vitrification. He uses gas oven for cooking as it reduces reductions as compared to electric oven. Luciano creates scenes using his characters which gives an aesthetic sense around.